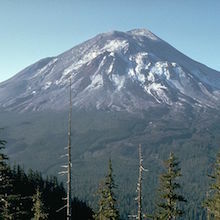 It’s been 35 years, writes David B. Williams @geologywriter.com , since the Mount Saint Helens blowout. At GeologyWriter.com, David takes us on a photo and essay tour of the mountain, which threw up a cloud of ash in May 1980. David was watching the news and wondering about his brother driving back from Portland. Where were you when it happened?